Having made only a few changes to the squad from the Asian Cup in January, it was unsurprising that Ange Postecoglou named a fairly familiar starting XI, with the unfortunate exception of a few injured players such as Matthew Spiranovic and Tim Cahill. However, the style of play, unsurprisingly, didn’t change. Postecoglou’s remit, as he has reminded us time and time again, has been to give the Socceroos an identity. He wants the side to be bold, aggressive and attacking. They won the Asian Cup by dominating possession in all seven games, becoming the epitome of a proactive, modern side – constructing play from the back, lots of rotations in midfield and a fast, mobile front third. As we saw in the 2014 World Cup, Postecoglou refuses to be intimidated by stronger footballing nations, and encourages his side to play in this manner no matter the opponent. This was exactly the case against Germany – right from kick-off, the Socceroos pressed high up on Germany, forcing a turnover inside eleven seconds. That was symbolic of the change in approach Postecoglou has instituted during his tenure. An interesting tactical feature of this friendly was Joachim Low’s decision to use a 3-5-2 formation. Traditionally, Low has preferred either a 4-2-3-1 or a 4-3-3 – the latter being what was used at the World Cup – but he has not been afraid to use unorthodox shapes in the past, and has history with experimenting with three at the back. Here, it caused his side problems in the build up phase. This was because Australia pressed high up on Germany’s back three, with Postecoglou’s front three matching up man for man whenever goalkeeper Ron-Robert Zieler had possession. This matchup meant that Zieler often had difficulty playing short to a teammate when looking to play out from the back. Australia’s front three worked very hard off the ball, closing down their direct opponent whenever they received a pass. To counter this, Germany had two solutions. Firstly, the ‘outside’ centre-backs were sometimes able to receive a pass quickly on their outside foot, which allowed them to play forward quickly into the wing-back. This would take Australia’s front three out of the equation and gave the German wing-backs time and space on the ball before an Australian central midfielder was able to slide across and close them down. The other solution was for central midfielder Ilkay Gundogan to drop into the German back three, creating a temporary back four. Mark Milligan often wanted to stick tight to Khedira, his direct opponent in the midfield zone, but appeared uncomfortable following him all the way upfield. This gave Gundogan (or sometimes, Sami Khedira) time on the ball at the back. However, Australia’s pressing still caused Germany problems, most obviously in the passage of play captured in the video below. In this sequence, Leckie closes down Benedikt Howedes, the central player in Germany’s back three, and forces the pass wide to right-sided centre-back Shkodran Mustafi. When Mustafi receives the ball, he is immediately confronted by Troisi, forcing an errant pass that Jason Davidson intercepts. The left-back quickly plays forward, and Leckie sprays a low shot just wide of the far post. Four days later, the Socceroos had an entirely different challenge. Macedonia are yet to qualify for a World Cup since becoming independent from Yugoslavia, and nor have they made it to the European championships. They are at the other end of the spectrum for Germany. Ironically, though, they probably represented the more suitable challenge. That is because Macedonia took the typical underdog approach. 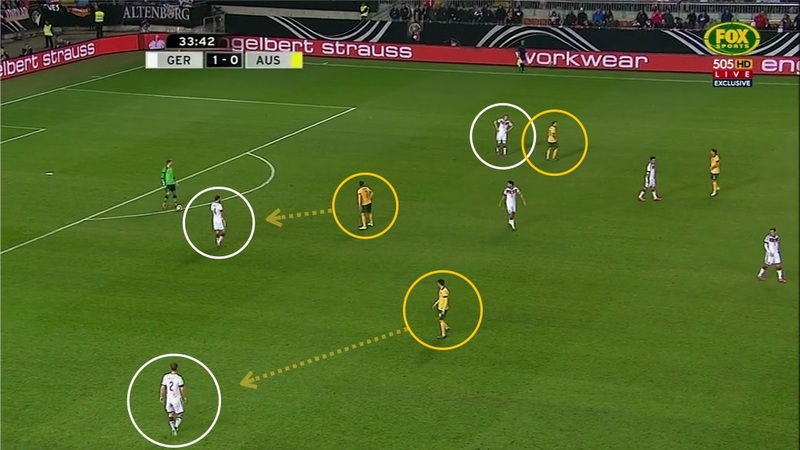 They defended in a flat 4-4-2, looked to get eleven players behind the ball, and attacked directly on the break. There was nothing sophisticated or revolutionary about their approach, but it is exactly the type of opponent Australia will face in their major challenge in the coming years – World Cup qualifiers. The weaker teams in Asia will most likely take the approach of Kuwait and Oman at the Asian Cup, and Macedonia here – defend compactly, and look to sneak a goal on the break. A 0-0 draw, as was the score here, is a good outcome. Despite having 70% of the ball (and completing nearly double the number of passes), the Socceroos created very few genuine goalscoring chances (with just four shots on target, and Macedonia managing just one). “We started brightly enough then got a bit frustrated and tried to force things,” said Postecoglou. “We had some chances which we needed to score to open them up, on the flipside I don’t think (our keepers) had a save to make. Interestingly, Australia struggled more here when they had the majority of possession as opposed to the Germany game, where they were able to create a number of high quality chances with 40% of possession. Obviously, possession is and never will be a total indicator of attacking potential, but it’s indicative of the ongoing feeling that Postecoglou’s side remains better suited to counter-attacking rather than breaking down a packed opposition defence. This line of thinking is supported by the fact that at the Asian Cup, Australia actually struggled to break down the teams that sat deep against them. For example, against South Korea (both in the group and the final), China and the UAE, there were actually few outstanding goalscoring chances – the breakthroughs came either through a rare moment of brilliance (Cahill v China, Luongo v South Korea in the final) or a set-piece (UAE). They struggled to consistently create meaningful shooting opportunities in those games – the only exceptions were against Oman and Kuwait, two sides whom it could be argued were so technically inferior to the Australians that it was always going to be difficult for them to stay in the contest (both teams, for example, contained semi-professional players). Interestingly, this is a trend that can be observed back to when Postecoglou was in charge of Melbourne Victory. There, he used a controversial dual 10 system with no out-and-out striker. The Victory, like the Socceroos, always played better when the opposition left space in behind their defence, and were less effective when playing against a deep-lying defence. While there are admittedly flaws to this analysis, it remains obvious from the two friendlies in this international break that Australia more dangerous in transition than in long periods of possession. Unfortunately, this is something beyond Postecoglou’s control – firstly, because dominating possession is a negotiable of his philosophy, and secondly, because Australia will ultimately be the superior opponent in the majority of their competitive matches in Asia. This, therefore, becomes the primary conclusion that can be drawn from this international break. Put bluntly, there is little to be learnt from drawing 2-2 with the World Cup winners if the side will struggle against teams that defend like Macedonia in World Cup qualification.